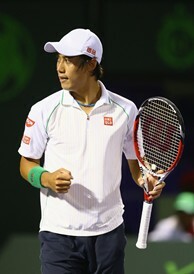 Kei Nishikori had a dream run at the Sony Open, beating Roger Federer and David Ferrer on his way to the semifinals. Throughout the year, EmiratesUSOpenSeries.com will feature players who could make an impact during this year's Series. Here’s a look at 24-year-old Kei Nishikori of Japan. The Baseline: Nishikori first made headlines in 2008, when he came through qualifying as a teenager to win his first ATP title in Delray Beach, Fla. He backed up that result by reaching the fourth round of the US Open, becoming the first Japanese player to do so in 71 years. He went on achieve a career-high ranking of No. 11 last June and has recorded wins over Top 5 players including Novak Djokovic, Roger Federer and David Ferrer. But Nishikori’s major wins have historically been mixed with perplexing losses; at least year’s US Open, he meekly bowed out in the opening round to world No. 179 Daniel Evans. It seems, though, that Nishikori may have finally found consistency in his results. So far in 2014, he has reached the fourth round of the Australian Open and defended his title last month in Memphis, Tenn. But it’s his showing last week in Miami that made tennis fans truly take notice. He saved four match points on his way to defeating world No. 4 Ferrer in the fourth round and then stunned two-time champion Federer in three sets in the quarterfinals. The Breakdown: A scrappy counterpuncher with plenty of endurance and foot speed, it’s perhaps fitting that Nishikori is now being coached by former world No. 2 Michael Chang. Nishikori also thrives on hard courts. All four of his ATP World Tour titles have come on the surface, and his lone Grand Slam quarterfinal came at the Australian Open in 2012. With those results, it’s surprising to many that he hasn’t had more success on the North American hard courts. While he has reached the third round or better in three of his five appearances in Flushing Meadows, he is just 7-8 in career matches in the Emirates Airline US Open Series and has yet to reach a single quarterfinal. But with wins over the likes of Federer and Djokovic, it’s clear that Nishikori has the ability to be a factor this summer. And with his newfound consistency, and a ranking that currently stands at No. 18 after his run in Miami, it’s very possible that Nishikori could put it all together this summer and finally conquer the Series.